The Mullen household in the mid to late 60's was, to put it mildly, chaotic. To begin with, there were 8 kids running around the house, four of whom were strong-willed teenagers. Occasionally, we also had our grandmother living with us, a woman who seemed to have been ill for most of her adult life. Mom did her best to keep the house running, but she was also the principal breadwinner of the family, working the third shift as a nurse at St. Francis Hospital. He was already in debt, having purchased a home on January 15, 1964, in an excellent area of Poughkeepsie. "... symptoms of bipolar disorder may emerge during the course of chronic alcohol intoxication or withdrawal. For example, alcohol withdrawal may trigger bipolar symptoms. Still other studies have suggested that people with bipolar disorder may use alcohol during manic episodes in an attempt at self–medication, either to prolong their pleasurable state or to sedate the agitation of mania. Finally, other researchers have suggested that alcohol use and withdrawal may affect the same brain chemicals (i.e., neurotransmitters) involved in bipolar illness, thereby allowing one disorder to change the clinical course of the other. In other words, alcohol use or withdrawal may "prompt" bipolar disorder symptoms (Tohen et al. 1998). It remains unclear which if any of these potential mechanisms is responsible for the strong association between alcoholism and bipolar disorder. It is very likely that this relationship is not simply a reflection of cause and effect but rather that it is complex and bidirectional." Dad ended up selling the woodworking business back to Mr. 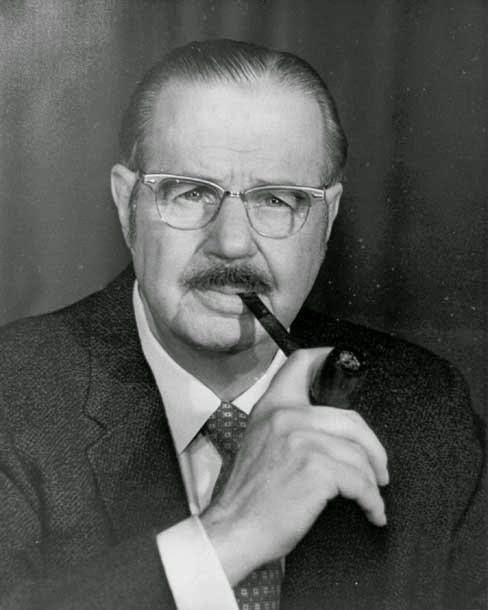 Wise in 1968. 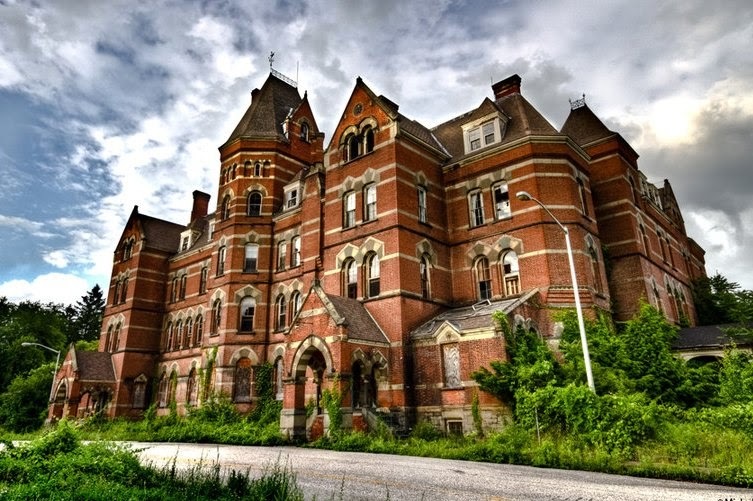 By then, he had been diagnosed with manic depression (as it was known back then) and forced to spend time in Hudson River State Hospital, a psychiatric hospital built in 1873. I remember little of Dad's time in that institution, only that it was a scary place and that Dad always left there a shell of what he had been prior to entering. This was almost certainly due to psychotropic drugs and the liberal use of shock therapy. In retrospect, it's hard to decide which condition was worse: the manic/depressive Dad or the semi-catatonic Dad. The semi-catatonic Dad was heartbreaking to see while the manic/depressive Dad -- dangerous, unpredictable, drunk, and ornery -- still had flashes of the man that he had been. Dad unsuccessfully battled both diseases until his death in 1988 from complications caused by liver failure. He was 64. One other thing to keep in mind as you read further: the estimated average age for the onset of bipolar disorder is the early 20's. When Dad was at his most manic alcohol was always involved, and he was an ornery alcoholic: verbally abusive, intimidating, always threatening physical violence but rarely resorting to it. For the most part, the damage he inflicted was psychological and emotional, but since we knew Dad had thrown a punch at Father Kenny (another hot-headed Irishman) we knew that he was capable of following through on his threats. His verbal harassment would occasionally take unintended comic turns. It was always amusing to be called "a blithering idiot". And when he started riffing on the importance of paying attention to a point he was making by saying: "I want you to know it, understand it, comprehend it, realize it, ... etc. ", you simply had to smile. But you sure as hell made sure to hide that smile! You knew that Dad was past reasoning with when he called himself "one tough Marine". All of his sons knew not to challenge him at that point and to have an escape route planned, either using the back stairs in the kitchen or heading out the porch window in the TV room. While we knew that Dad was "one tough Marine", that's about all we knew as kids. Dad didn't talk about his time in the Corps at all. It was only after he died that I began to learn isolated facts about his time in the military from his siblings. I learned that he was a tail gunner and that he actually saw action in the war overseas. 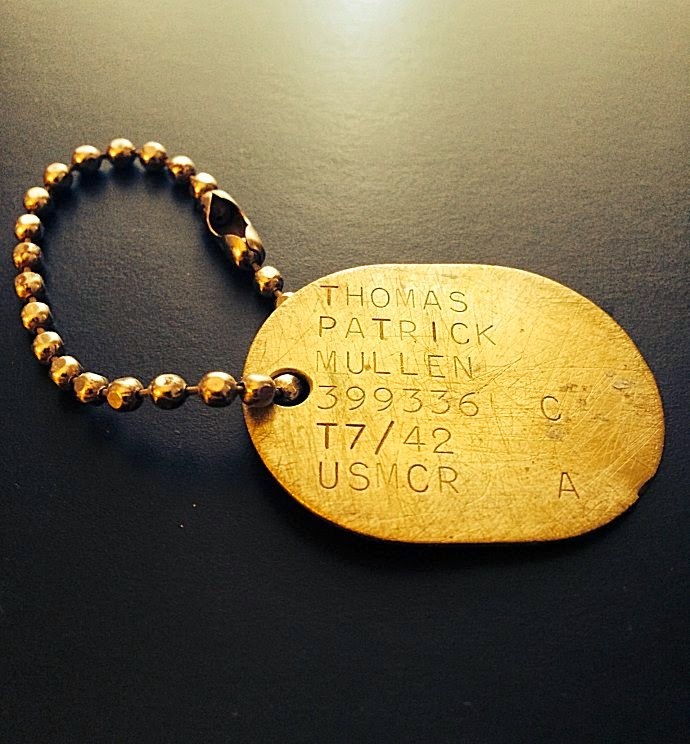 Through my cousin, Danny Sears, I came in possession of Dad's dog-tags. But most important, I learned that Dad received a dishonorable discharge of some sort. None of his siblings could tell me exactly why Dad had been dishonorably discharged. The best they could remember was that it had something to do with a stolen watch. In 2005, I wrote away to the National Personnel Records Center and asked for information related to my father's discharge. In response, I was sent a one-page document labeled Report of Separation that stated only that he had separated from the military on January 19, 1946, with a "bad conduct discharge". While that didn't shed any new light, it did confirm that Dad had, indeed, been less than honorably discharged from the Marines. At the time that was enough. I filed the paper away and thought no more about it. In late 2014 my sister, Annie, started badgering me to learn more about Dad's discharge. Since I had recently retired from my job at Bristol-Myers Squibb and had begun dabbling in genealogy, Annie figured that I had "all the time in the world" to determine why Dad had received a Bad Conduct Discharge (BCD). In this isolated instance, Annie was absolutely correct. After a few hours of research on the web, I learned that I could petition the National Personnel Records Center for Dad's entire Official Military Personnel File. The paperwork was minimal and it didn't cost much, but it took over three months for his file to arrive. When I finally read through it, though, it painted a picture of a man who might very well have been "one tough Marine". 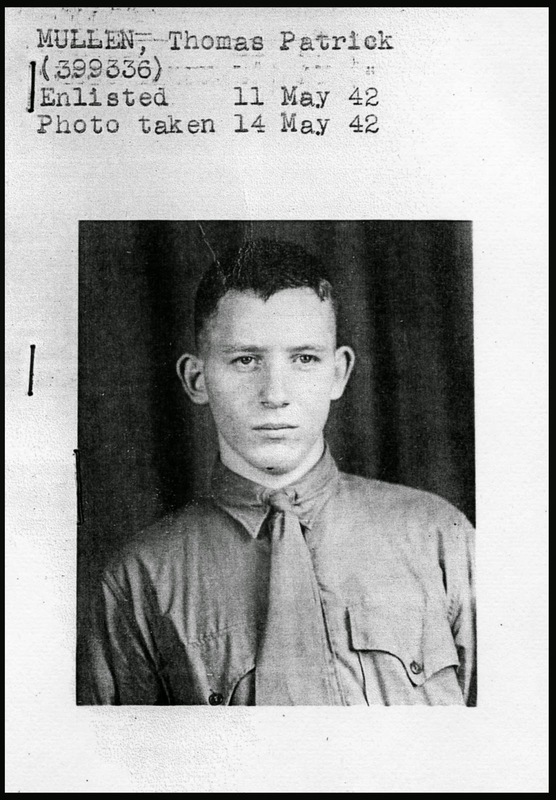 May 11, 1942: Placed into Active Duty; ordered to report to the Marine Corps Recruit Depot in Parris Island, SC. November 5, 1942: Promoted to Private 1st Class. February, 1944: Completed 2 week Operational Radar Training at Fleet Air Marine Corps Radar School in Santa Ana, CA. "Disobedience of the lawful order of his commanding officer." "This incident was the discharging of a machine gun. I had noticed the feed of my machine gun to be out of aline so I charged it to test the proper feeding of ammunition. Due to the conditions under which I was operating, I neglected to clear and the gun discharged accidentally. The gun was later proven to be defective." Whether this is an accurate transcription of the event will never be known. What is known is that Dad was found guilty by a Deck Court-Martial (DM) on April 14, 1944. He was reduced in rank to Private 1st Class and had to perform 30 days of extra police duties (EPD). Note that, in 1944, a Deck Court-Martial was an informal procedure used to judge minor offenses. They were held with just one officer present, the Deck Officer (i.e., the officer on watch) who also represented the Captain. The results of these trials were rarely granted an appeal. "Did on or about 29 April, 1944, wilfully take and use an automobile namely a Ford convertible coupe, the property of Norman LaBudda of Santa Ana, California, without the permission of the said owner, and in the absence of the said owner or his representative, and did proceed to use and transport himself in and about the city of Santa Ana, California, and the vicinity thereof." "At this time I was charged with stealing an automobile. I was on authorized liberty with a buddy at the time. We had been drinking and in mischief, with no intent of malice, did appropriate a car not belonging to us or any one known to us. My buddy was driving and we were involved in an accident the financial extent of which was $600.00 which my buddy and I paid in equal shares. The incident was settled to the satisfaction of the car owner but we were later given a summary court with a resultant 30 day confinement and 90 day EPD." Note that $600 was a hell of a lot of money back then, comparable to approximately $8,000 today. There's no indication of where Dad got the money to settle that debt but, after almost two years of service without a blemish, he now had accumulated two disciplinary marks on his record in less than three weeks. Note that one had occurred while under the influence of alcohol. September, 1944: Joined Marine Air Group 45 (MAG-45) . December 18, 1944: Member of Scout Bombing Squad 245 (VSMB-245). This appears to be the only aircraft squad in which Dad flew combat missions. 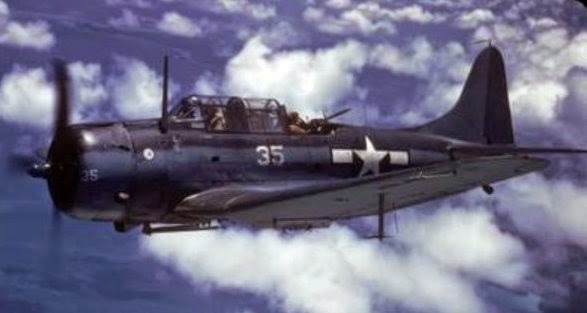 As far as I can tell, Dad would have been the tail gunner of a Dauntless SBD-5 Bomber, operating a M1919 Browning machine gun. December 31, 1944: Semi-annual Performance and Conduct Review; received Good to Excellent marks with perfect scores for Obedience and Sobriety. May 19, 1945 - September 30, 1945: Per a note in his file from his Commanding Officer, J.E. 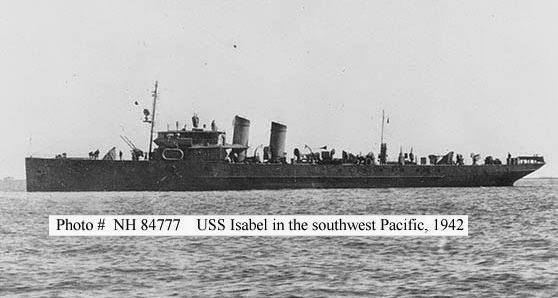 Bell: "Served as a regularly assigned crew member of combatant aircraft assigned to this squadron since 19 May 1945. Participated in combat operations in the Western Carolines Area from 19 May 1945 to 30 September 1945." June 30, 1945: Semi-annual Performance and Conduct Review; received Good to Excellent marks with perfect scores for Obedience and Sobriety. American Campaign Ribbon: Awarded for service within the American Theater between December 7, 1941 and March 2, 1946. Asiatic Pacific Ribbon: Awarded for service within the Asiatic Pacific Theater (Alaska, Hawaii, Philippines, Australia, New Zealand, and all of Asia) between December 7, 1941 and March 2, 1946. 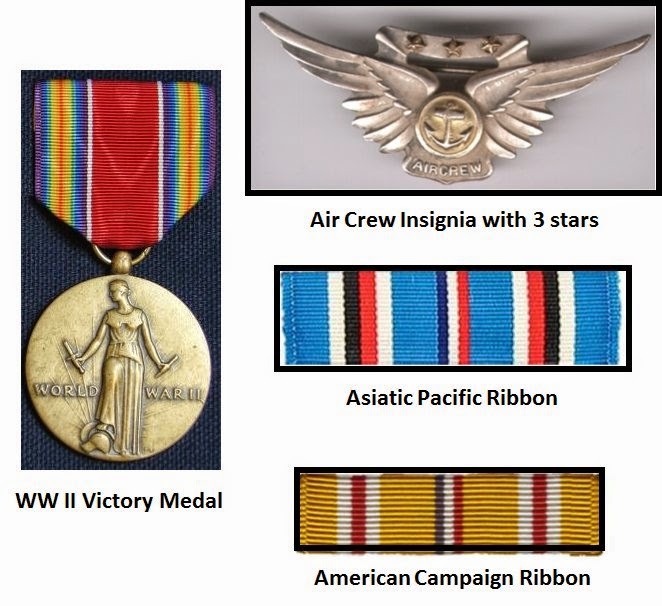 Aircrew Insignia with 3 stars: Awarded to enlisted aircrew members who flew in combat; each gold star represented a combat mission. World War II Victory Medal: Awarded to W.W. II military personnel. Dad's service record and discharge papers also indicate that he was a "rifle marksman" and a "pistol sharpshooter". 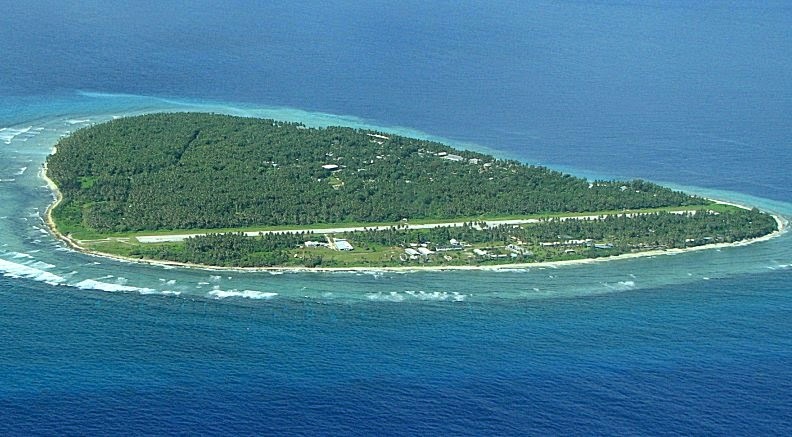 "At this time I secured a watch at Ulithi Atoll. I was in a flight crew and had never been issued a watch which I needed. There had been general appropriation of needed articles, though unofficial, and I signed as a S/Sgt in order to secure a watch." September 28, 1945: Rank reduced to Private. September 30, 1945: Flight orders revoked. January 19, 1946: Officially separated from the military. "The Board concludes that the petitioner's discharge is proper under reasonable standards of Naval Law and Discipline. Petitioner was convicted by a SCM on 19 Sept 1945 for attempted fraud and impersonating a superior officer. In order to enable him to procure a wrist watch he had misrepresented himself as one "Staff Sergeant Joseph J. H. Hueghs", a fictitious person and forged this name on a quartermaster memorandum receipt. To enable him to misrepresent himself, he wore the insignia of a Staff Sergeant. In view of the seriousness of the offense, it is the opinion of the Board that petitioner's discharge is proper." It's interesting that Dad used a pseudonym of "Joseph Hueghs" in his caper. That name was very close to that of his uncle, John F. Hugues, who was a chaplain and a Captain in the Navy at that time. "If there is any possible way by which this matter can properly receive further consideration it will be much appreciated. I have read the statement filed by Major Winston E. Jewson USMCR, under date of 20, March 1946, as well as a statement by 1st Lt. Orlo E. Stokoe, USMCR, of 26 March 1946, and am of the opinion they outline sufficient reason for more favorable action." "Mr. Mullen's case was thoroughly reviewed by the Board of Review, Discharges and Dismissals on 21 November 1946, at which time the statements of Major Jewson and Lieutenant Stokoe were taken into consideration. The board concluded that the bad conduct discharge awarded Mr. Mullen was proper under reasonable standards of Naval law and discipline and rendered decision that no change, correction or modification should be made. .... I regret, in view of your interest, that further action is impracticable unless additional evidence can be submitted to substantiate a reopening of his case." "Thomas Patrick Mullen ... was convicted by a summary court martial, approved 26 September 1945, for attempted fraud and impersonating a superior officer. He was sentenced to be discharged from the U.S.Naval Service with a bad conduct discharge." Satisfied that this incident in the life of a 22 year old Marine had no bearing on the job being offered, IBM hired Dad. "The punishment of death, or such other punishment as a court martial may adjudge, may be inflicted on any person in the naval service who ... disobeys the lawful orders of his superior officers"
First enacted in 1951, the UCMJ consolidated and revised the existing laws governing the separate branches of the service (the Articles of War (AOW) and the Articles for the Government of the Navy) into one standard code. These systems of justice were similar in many ways. Both allowed for non-judicial punishment of enlisted service members, and for three levels of courts-martial, roughly equivalent to the three levels set out in the current UCMJ. In the Navy, the three levels included the deck court-martial, the summary court-martial, and the general court-martial. The Army had a summary court-martial, a special court-martial, and a general court-martial. The most significant difference between the two systems was that the punishment at a Navy summary court-martial could include a BCD. Up until 1948, the AOW had no such discharge; the only discharges Army courts-martial could adjudge were dismissals for officers and Dishonorable Discharges (DD) for enlisted members.21 The Navy’s pre-UCMJ BCD was not, however, considered serious punishment. Although authorized as part of a court-martial sentence, the BCD was akin to the administrative discharges used today. No apparent stigma attached to such a discharge. The Navy separated thousands of sailors with BCDs during World War II (WWII) with no procedure for judicial appellate review. Before enactment of the UCMJ, both the Naval and Army justice systems were seriously flawed. The systems were intended to secure obedience and to ensure Soldiers and Sailors served the commander’s will. Although both systems provided for courts-martial, the courts looked nothing like today’s courts. Courts-martial were merely a tool of the commander to carry out his intentions regarding discipline. There was little, if any, relation to civilian criminal justice. Protecting the rights of the individual was not a primary purpose of the system. As a result, great injustices were done in the name of discipline. During WWII, over sixteen million men and women served in the armed forces. Commanders conducted over 2,000,000 courts-martial, resulting in many hundreds of thousands of convictions and stiff sentences. After the war, individuals and institutions lobbied Congress for changes to the system, highlighting its flaws—defense counsel (DC) were not lawyers, law officers who presided over trials were not lawyers, sentences were unable to be revised and trial mistakes could not be corrected. Some of the longstanding complaints were expressed to TJAG of the Army, Major General Crowder, in a letter from the Secretary of War following WWI. In response to these criticisms, Congress, in 1947, attempted its first large-scale effort to reform the military justice system. Based on this analysis, Dad's appeal in 1946 didn't stand a chance. Curiously, the above analysis states that there was "no apparent stigma" attached to a BCD back then. While Dad was able to obtain a good job with a major corporation, his BCD undoubtedly left him with a lifelong emotional scar. It also prevented him from obtaining veteran benefits and from holding any type of job within the government. Dad was positively diagnosed with bipolar disorder in his early 40's. The medical establishment now believes that the estimated average age for the onset of this disease is the early 20's. Dad's first disciplinary incident with the military occurred when he was almost 21. Manic episodes are often accompanied by or intensified by alcohol. Dad's second disciplinary incident with the military occurred while he, in his own words, "had been drinking and in mischief". Stress caused by drastic or sudden life changes, even positive ones, can trigger a manic episode. Dad's third, and most bizarre, disciplinary incident occurred at probably the highest and most active point of his military career. He was stationed at Ulithi Atoll, a combat zone in the Pacific, and participated on regular bombing missions as a tail gunner. His performance on these missions was seen as exemplary. He had recently received a good semi-annual Performance and Conduct Review. Dad probably thought he was invincible. I'll finally end this requiem with an experience that I had with Dad back in 1966 or 1967. Although I didn't know it at the time, Dad was solidly in the grip of bipolar disorder. My brother, Tom, and I were on a tour of West Point with the Boy Scouts. We traveled there from Poughkeepsie in a bus with the other scouts and Dad met us there, driving down to the Academy in a car by himself. As we prepared to board the bus at the end of the tour, Dad asked Tom and me if we wanted to drive back home with him. Tom declined but I said yes, knowing that it would please him. After the bus left, Dad decided to reward me by taking me on his own personal tour. We walked around West Point for a few more hours, watched part of an Army football game, and stopped at a carnival on the way home. It was probably the greatest day I ever had with my father. 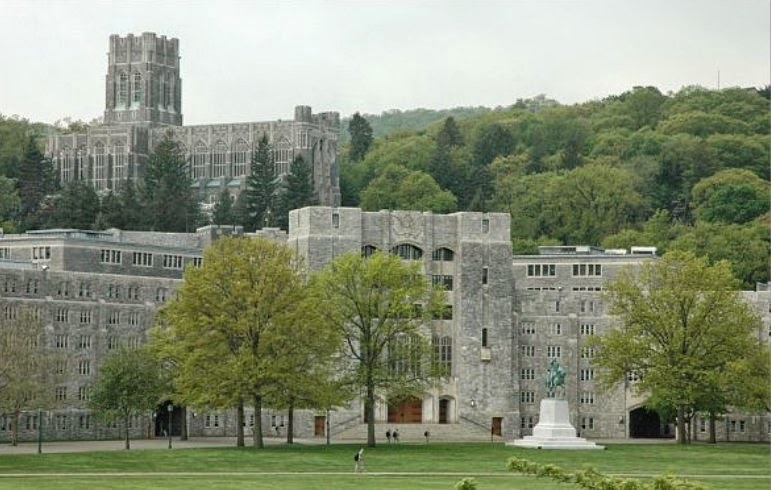 After walking around West Point for a bit, Dad announced that it was time for dinner and guided me to the famous Cadet Mess Hall. Once inside, we encountered a receptionist seated by a sign clearly stating that the Cadet Mess was available only to cadets and their official guests. Dad didn't miss a beat. He strolled up to the receptionist and said, "Excuse me, we're here to see Cadet Mullen. When he shows, please tell him we're inside waiting for him." And, with that, we walked inside. While eating dinner we heard the receptionist repeatedly paging "Cadet Mullen" over the loudspeaker and had a good laugh. Today, though, I see that incident through a much different lens. At West Point, Dad had undoubtedly been in the middle of a manic episode. He wanted something and he wasn't going to let a damn fool military regulation stand in his way, even if he had to impersonate someone in order to get it. In 1945, he wanted a watch. In 1967, he just wanted to eat dinner. "So when, exactly, is Mullen Christmas this year?" 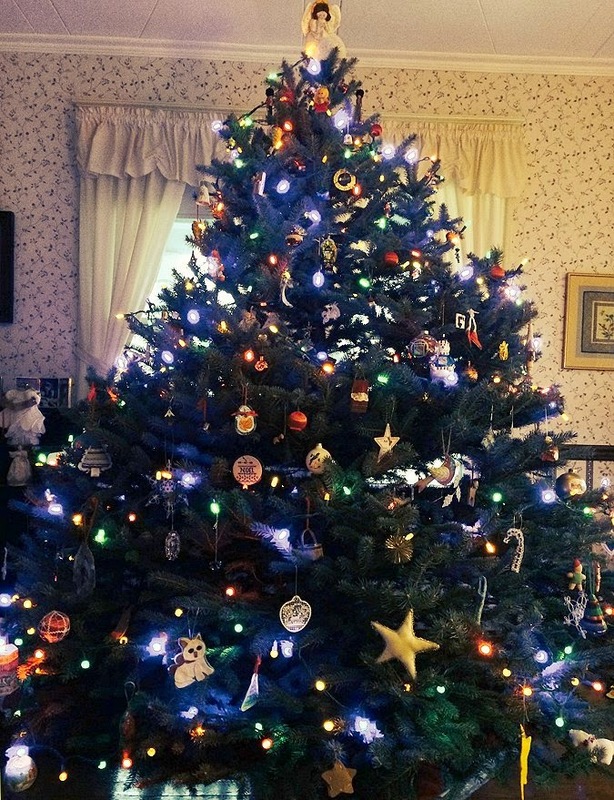 "By tradition, Mullen Christmas is always on Saturday at 2pm in the first full weekend after New Year's Day." 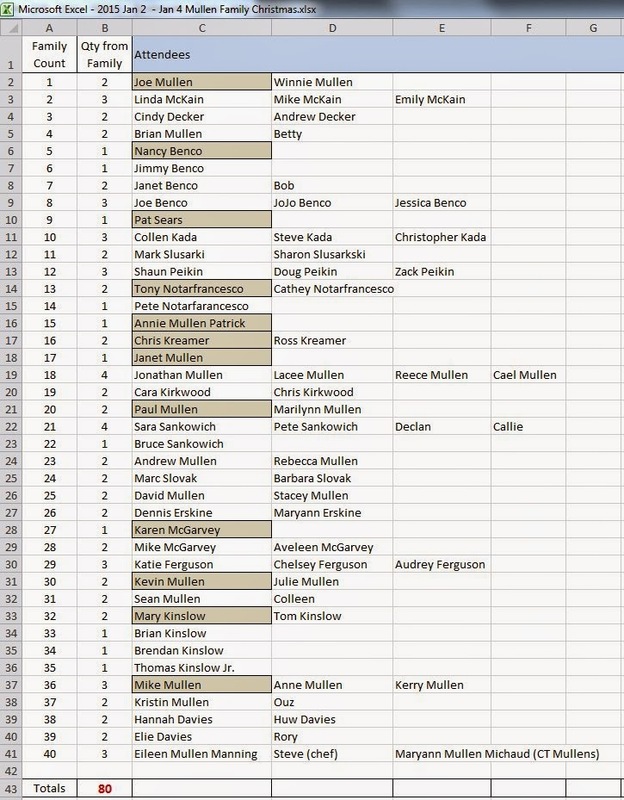 Since Friday is part of the weekend (at least in my book) that means that the earliest that Mullen Christmas can possibly be is on January 3, which is what happened this year. To prove the historical accuracy of this "tradition", I did a little research, beginning with one of the most memorable Mullen Christmas parties ever held: the 1997 party at Aunt Pat and Uncle Harry's. I remember that party like it was yesterday. Actually, I don't remember too many of the attendees, I have no idea what I ate, and I think I drank some beer, but I can't be sure. What I do remember, though, is that the New York Football Giants played the Minnesota Vikings in an NFL playoff game. I have long forgotten the details about many, many playoff games, but the details of that particular game will never fade. The Giants thoroughly dominated the first half and were cruising to an easy victory. With less than 4 minutes left in the game, they were up by 9 points and had just forced Minnesota to punt. The game was, as they say, in the bag. But in a stunning collapse -- from a franchise that has turned collapsing into an art form -- the Giants ended up losing the game. But what makes this game so gruesomely memorable is one specific detail. The Giants' arch-rival, the Philadelphia Eagles, had a truly horrible team in 1997, finishing with a meager 6 wins. Even so, they managed to stretch a hand from the grave. Their ex-quarterback, Randall Cunningham, was Minnesota's starting quarterback that day, and he led his team to two amazing scores in the last 90 seconds to defeat the Giants 23-22. "In the modern era, Mullen Christmas is always on Saturday at 2pm in the first full weekend after New Year's Day." 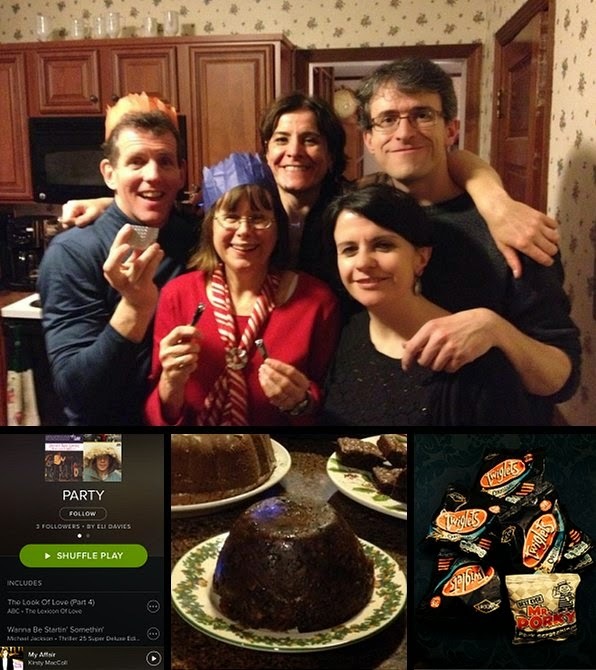 When did Aunt Mary and Uncle Nick first begin the tradition of a post-Christmas Mullen Family party? 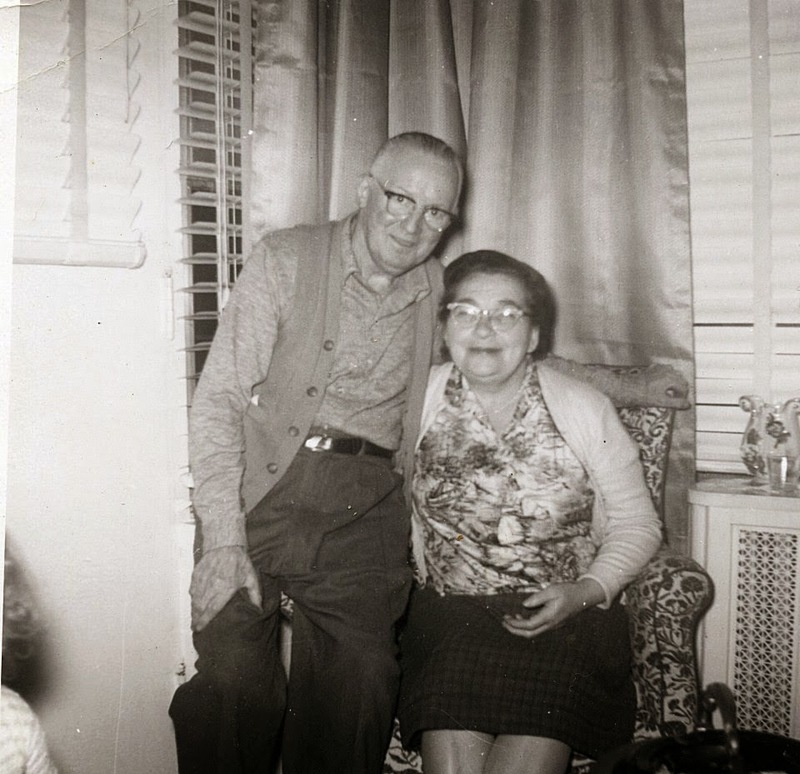 Was there ever a post-Christmas party while Grandmom and PopPop were alive? If so, did they attend? What was the last year that Aunt Mary and Uncle Nick hosted the party? What was the first year that Marilynn and I hosted the party? Who (besides Aunt Mary & Uncle Nick and Marilynn & I) have ever hosted a Mullen Christmas party? If you know the answers to any of these questions, leave them as comments to this post so that all can see. Enough of history ... on to a recap of this year's party! The 2015 Mullen Christmas party was truly one for the ages. According to Mike Mullen, the Chief Statistician, there were a total of 80 attendees! Somehow, everyone managed to avoid a parking ticket and find a parking spot within a reasonable distance of the house. The Chief Statistician has also pointed out that if other attendees from year's past had been able to attend this year's party (e.g., Tara), we conceivably could have had 113 attendees! If that day ever comes, I'll have to reinforce the kitchen floor. The Connecticut Mullens in attendance! After an extended absence, the Connecticut Mullens were once again represented at Mullen Christmas as Maryann and Eileen (along with Eileen's significant other, Steve) drove down for the festivities. This prompted a lively debate as to how long, exactly, it had been since their last visit. Sharon and Mark were convinced that it was no more than 5 years ago. Eileen and Maryann were pretty sure that it was more like 8 or 9 years ago. As it turns out, the Connecticut Mullens made their last an appearance in 2005, exactly 10 years ago (proof here). While we never got a chance to see Steve demonstrate his party trick of deadlifting an economy car, everyone got a chance to look at some excellent old photos of Grandmom and Pop Pop that Eileen brought with her (sample below). Who knew Kevin was a dead ringer for Pop Pop? Pete Notarfrancesco drinking shots! A year and a half ago or so, Pete spent some time at a place called the Balkan Camp in the Catskills. I've seen some videos and read an article or two about it, but it's hard to describe exactly what it is. Let's just say that it's advertised as "Balkan music, dance and singing classes during the day, Balkan-style partying during the night." It was at this locale that Pete became acquainted with a beverage called Slivovitz. For months he had been threatening to bring some to Mullen Christmas. Well, he did just that and, for the first time in my life, I ended up drinking shots (2) with Pete. 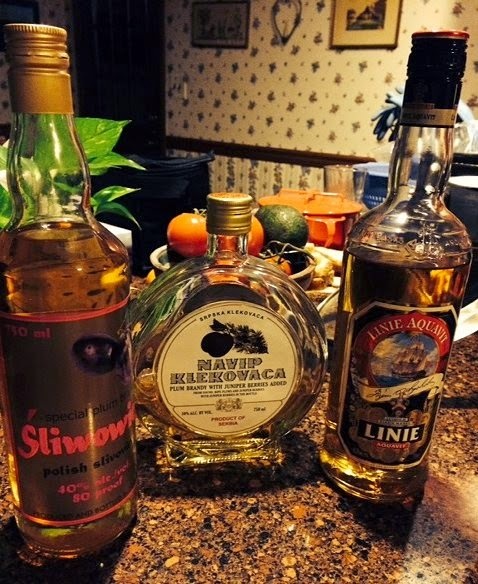 The Slivovitz wasn't bad but the Aquavit which he also brought was obviously intended for a different breed of human. After drinking a shot I had to quickly down a beer in order to restore my esophagus to working order. If you missed out on this event, fear not. We didn't finish the bottles. I have a feeling there will be a reprise next year! The British are coming! The British are coming! In a manner not unlike Paul Revere's ride in 1775, this year's Mullen Christmas attendees were given ample warning of the impending arrival of Her Majesty's forces. Not owning a fast horse, I opted to use Facebook and Gmail instead. Despite the warning, though, the party was clearly unprepared for the onslaught. The Davieses (Hannah, Huw, Eli, and Rory Macqueen) came with their own music (a three hour playlist); they came with figgy pudding (which they set on fire with Slivovitz); they came with Christmas Crackers (forcing us to wear silly paper hats); and they came armed with Twiglets, the only known substance that actually makes Aquavit taste good by comparison. While their were only four of them it seemed as if they were everywhere. One can only imagine the pandemonium if John and Máire Davies had been able to attend the party as well. Well, there's always next year! The Miracle of the Food and Drink! While most people think that this particular miracle only works with loaves, fishes, and wine, it clearly works on other substances as well. For the first time in recent Mullen Christmas memory, we neither ran out of food nor had to make an emergency alcohol run. When one dish of food was finished another one magically appeared in its place. There was ziti, lasagna, swedish meatballs, roast beef, meatballs and sausages, little hot dogs, vegetables/dip, salad, rolls, and a bunch of other dishes that I never even saw. And that's not counting the appetizers and all of the desserts. Regarding alcohol, while we did drink the Mullen's Irish Cream, a bottle of Jameson, a bottle and a half of Bushmills, a half a bottle of Slivovitz 3 bowls of punch, about 4 cases of beer and countless bottles of wine, there was still alcohol left at 12:30am when the last of the stragglers went to bed. 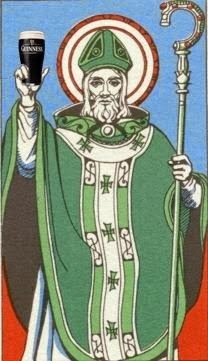 I don't know who prayed to what Saint, but thank you for doing so. Oh, the weather inside was frightful! Snow flurries, sleet, and freezing rain fell most of the day, having a significant impact on the party. 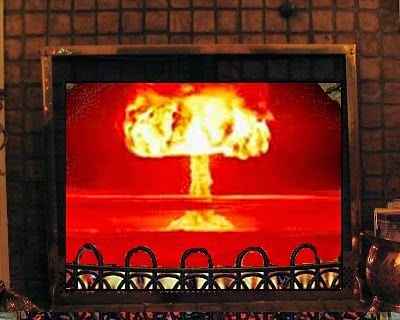 While it had no effect whatsoever on turnout, it caused the football crowd in the TV room to go into a fireplace-stoking frenzy! At the height of the party the temperature in the TV room peaked at around 90 degrees, causing Brian Mullen, Dennis Erskine and I to escape to the screened in porch to grab an ice-cold beer and cool off. Even the kitchen, warmed only by the ambient heat from the TV room must have hit 80 degrees. In year’s gone by, there were a variety of ways that I got a chance to see my aunts, uncles and cousins. When I was a lot younger, there were visits to Grandmom and Pop Pop’s and the occasional family gathering at the shore. 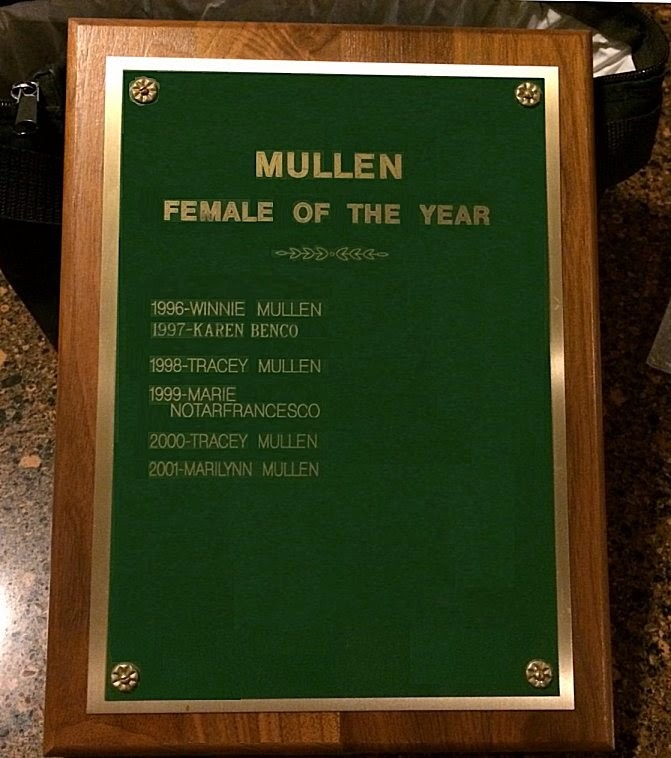 As I got older, there were all of the cousin weddings and, for a few fantastic years, the annual Mullen Cousins Picnic and Camp Out at Joe Benco’s house, complete with a bonfire and “Mullen of the Year” plaques! As everyone’s nuclear family has grown, though, the opportunity for all of us to get together has almost vanished. As much as you might want to, you simply can’t invite everyone to a shore house for a weekend or to the wedding of a cousin-once-removed. What we have managed to hold onto, though, is Mullen Christmas. Yes, it’s loud and it’s crowded, and it's almost impossible to have an in-depth conversation with anyone, but I wouldn’t miss it for the world. It gives me a chance, however fleeting, to connect with everyone again, even the next generation (damn, has Drew gotten tall!!) It’s one of the main reasons that I continue to hang onto my house in Cranbury. So, even though Mullen Christmas just ended, I’m looking forward to seeing everyone again next year. And this time I don’t even need to tell you when it is.